Cover picture: I begged a cutting of this un-named Tephrocactus which I guess was T. articulatus. When you get a new plant that you really, really want to grow you wait for the first signs of growth to show that roots have been produced. At the tip of my cutting something was happening - it had obviously rooted. However the new shoot was quite strange and unlike the joint below. Soon I realised that my cutting was going to flower and the picture (left) is on the NN cover. Since then my cutting has produced three normal new shoots. Whether it will flower again at such a small size is doubtful! What to write in the editorial this issue? Well, I cast my eyes to the books that adorn (the FL would say infest) the study wall here. I must get my recent issues of the BCSS journals professionally bound. The BCSS (new name for the NCSS and GB Soc) started in 1983 so we are in our 25th Anniversary year, (whatever that is called); I really enjoyed the celebratory special conservation issue of Cactus World’ and the bumper Bradleya. Thanks to both our editors, Roy and Colin. In 1972 we could buy the three volume Jacobsen’s ‘Handbook of Succulent Plants’ for nearly £16. The six volume modern equivalent IHSP is pushing £500. Echeveria ‘Perle von Nürnberg’ was a new hybrid then. It turned up here recently in a Mothers’ Day present for the FL so it has stood the test of time, (and the 1972 GB printers set the type with those dots over the ’u’. Good guys). 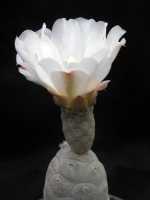 Bill Maddams wrote an article on the variability of Mammillarias. Four pages of close type with just four pictures said to show variation in the M. microcarpa complex, the black and white pictures show plants which look very similar. I am afraid that my eyes clouded over when I read the words ‘genotype’ and ‘phenotype’ (actually ’Mammillaria’ as well), but I did glance at the text. The term ‘complex’ was apparently becoming popular and explained as applying to ‘a group of species which are difficult to distinguish... where the botanist does not have enough information to reach a logical conclusion’. Now there is a word which is still widespread and sufficed for me with a lot of Baja Mammillarias! Actually, a great many of the articles were really technical. If you have ever complained that some of the present BCSS journal is too scientific perhaps you should look back. Hey, maybe we were all more intelligent in 1972. If, like me, you like books, it’s handy to have some references for the cacti and succulents you grow. The FL was doing some teaching preparation and searching for something to wind lengths of wool onto. She was offered Pilbeam’s ‘Mammillaria’…. Just a little short. Ah ‘Namaqualand, a Succulent Desert’ by Cowling and Pierce. Just the job, it’s great to have a well stocked library. The Hon Sec was contacted by a student from the local University who asked if she might attend a few meetings to help with her dissertation / thesis. Now I find that very curious. Very curious indeed. Having heard some of the titles of research papers at my son’s Stirling graduation, (he got a 2.1, we were very pleased, and thanks for asking), there were some very strange topics studied there (say no more). What possible interest would the motley crew at a cactus club meeting have for an undergraduate conducting some research? I should have been emptying the dishwater but some titles sprang to mind: ‘Somnolent tendencies in cactus club audiences’, ‘Erratic deviations from standard statistics when applied to the Cactus Club raffle’ and ‘Obsessive interest in minor variations in the genus Mamillopsis’, The FL added ‘Compulsive cactus book hoarding and the break up of the English marriage’, you get the idea. I was standing in the greenhouse the other evening. It was too dark for serious study but in the dim light new insights can be gained into just how many Sulcorebutia species there are. I was just pondering that perhaps there was only one when an eerie glow lit the plants and a Patagonian chill suddenly descended. I froze and ten inch cholla spines stabbed my hands and feet, pinning me to the floor and staging. I couldn’t move. Opuntia glochids suddenly sprouted from every inch of bare skin tormenting my nerves and inducing an itching agony that my trapped hands could not relieve. Was this a bad dream? ‘I am the spirit of a cactus past’, a disembodied voice with a thick Spanish accent replied.’ Oh no, it was a cactophile’s nightmare. ‘We are the spirits of cacti past.’ It was my worst nightmare. A vision of all the cacti I had once grown flashed through my brain. My God, I had a bucket full of old labels; were they once actual plants? We are the Rebutias you failed to spray against red spider and were chewed to ugliness from pristine beauty. You then consigned us to the compost heap. 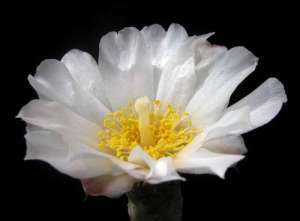 ‘We are the Mammillarias you scorched to death in the heat waves of your Youth.’ Gracious, I once had every one of the Stylothelae – now I had only one. (Mammillaria, that is). I was reminded of that suffering as an ethereal mist of Euphorbia sap descending on my body and blistered my tortured flesh. ‘We are the spirits of the other succulents past.’ Even as I writhed in agony it was good to know ghouls knew the correct semantics. Just then, when I thought this could not get worse, the F.L. came round the corner. Yes of course there was more than one species of Sulcorebutia; whatever gave me that idea?